From left to right: S. Ohira (QST), J. Schwemmer (F4E), P. Cara (IFMIF/EVEDA), K. Sakamoto (QST) and S. Ishida (QST) standing right in front of the LIPAc. While the focus of F4E is European and involves strong ties with European partners, the sites linked to the Broader Approach agreement are located in Japan. In addition, the international nature of the ITER project involves working together with Japanese colleagues in areas such as Magnets, Remote Handling and Neutral Beam heating systems. As a step in maintaining and deepening working relationships with our Japanese colleagues, F4E Director Johannes Schwemmer visited Japan. The F4E Director headed first to Rokkasho where the sites for the International Fusion Energy Centre (IFERC) project and the Engineering Validation and Engineering Design Activities for the International Fusion Materials Irradiation Facility (IFMIF/EVEDA) are located. He visited the facilities including the Linear IFMIF Prototype Accelerator (LIPAc) where commissioning is steadily progressing. One of the highlights included seeing its control room which the F4E team has recently upgraded ̶ a very challenging job for the most powerful accelerator of this type in the world. In addition to spending time with the F4E employees and other European researchers based in Rokkasho, Johannes Schwemmer also met with the management team of the Rokkasho Fusion Institute ̶ Yoshitaka Ikeda (Director General), Shinichi Ishida and Shigeru Ohira (Deputy Director-Generals). The F4E Director and P. Cara (IFMIF/EVEDA Project Leader) during the visit at the Rokkasho Fusion Institute. Travelling on to Naka and the JT-60SA site together with Prof. Sibylle Günter, Head of IPP Garching and during this visit representing EUROfusion, the F4E Director met with Dr Yutaka Kamada, JT-60SA JA Home Team Leader. The Director was notably impressed by the sheer size of the JT-60SA machine which will be the largest tokamak in the world once it starts operating. He understood that 2019 will be a very intense year full of challenging assembly milestones. The meeting focused also on understanding more about key Japanese technologies used to build systems for both ITER and JT60SA: the Electron Cyclotron/Gyrotron heating systems; Neutral Beam; and Blanket Remote Handling. Johannes Schwemmer discussed strategic planning with Kenkichi Ushigusa, Managing Director of the Fusion Energy Research and Development Directorate of QST, where it was agreed to continue work on the planning and financing for Broader Approach phase 2 in order to open up for future collaboration. In addition, F4E and QST will look for more involvement of accelerator and materials research communities from Japan and Europe to strengthen the team and future use of LIPAc. During the second day in Naka focus was on discussing research planning for the joint exploitation of JT-60SA. Prof. Sibylle Günter had a key role in these discussions. The JT-60SA machine in Naka. From left to right: M. Hanada (QST), J. Schwemmer (F4E), S. Günter (IPP), Y. Kamada (QST) and S. Ide (QST) in front of the JT-60SA machine in Naka. In Tokyo, Johannes Schwemmer met with Dr Gediminas Ramanauskas, First Counsellor, Head of Science and Technology section at the Delegation of the European Union to Japan who demonstrated a strong interest in the BA and ITER research co-operation between Europe and Japan. 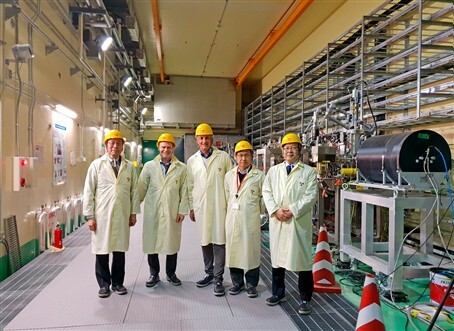 Together with Makoto Sugimoto, Director of the ITER Department within the Fusion Energy Research and Development Directorate of QST, Johannes Schwemmer then travelled on to the Toshiba product operations in Kawasaki and Yokohama. He viewed the manufacturing activities for the huge stainless steel coil case components which will be used, partly by F4E, to build ITER’s TF coils. The F4E Director was glad to see how the investments in automation, infrastructure and tooling that Toshiba has made optimise the manufacturing process. At the Toshiba Keichi plant in Kawasaki, Johannes Schwemmer met with Toru Shibagaki, General Manager of the Keihin Product Operations, who assured Toshiba’s commitment to quality and schedule: the work area for the coil cases has increased by around a third, and the work organised in three shifts. 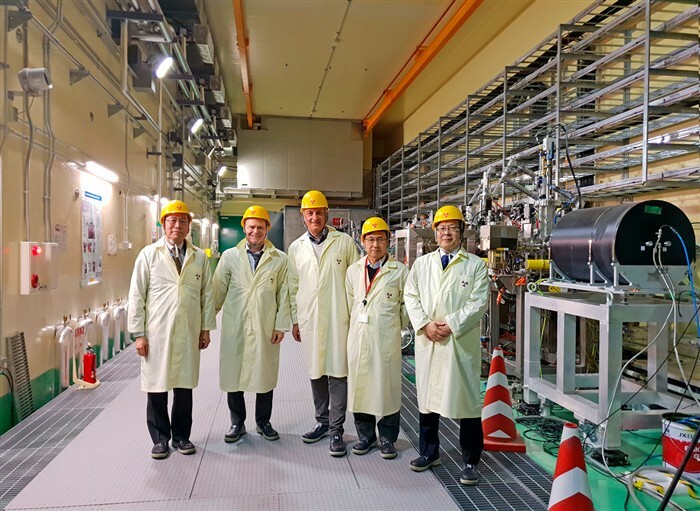 Concluding his visit in Japan, Johannes Schwemmer said “I am very impressed by the professionalism and dedication of our Japanese partners which in practice translates to fruitful collaboration and progress concerning Broader Approach and work related to ITER”. From left to right: Y. Sumi (Toshiba), I. Senda (Toshiba), M. Sugimoto (QST), J. Inagaki (Toshiba), J. Schwemmer (F4E).